Mt. Manaslu that lies at the elevation of 8156M and world’s eighth highest mountains in the world stays majestically away from the crowds. Similar in many respects to the Annapurna tour, the Manaslu trek takes place in a valley of lesser frequentation. The recent construction of lodges sees this circuit evolve over the years. The gompa (monastery) of Sama, in an amphitheater at the foot of the Manaslu, marks the entrance into Buddhist territory. The Larkya Pass (5140m), the high point of the route, presents a gentle slope before plunging abruptly to reach the lower valleys. Superb panoramas, typical villages inhabited by different ethnic groups. 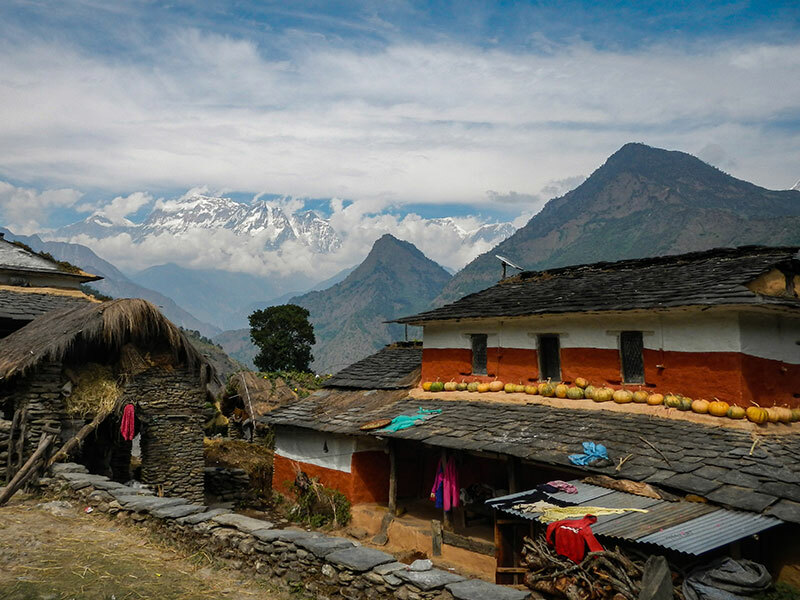 This trek avoids the walk on the dusty road at the beginning of the classic route, instead it passes through beautiful Gurung villages like Barpak and Laprak and join the classic Manaslu route in Khorlabesi. This is one of the real highlight of this trip. An acclimatization with the ascent to the Punggen Monastery at the lap of the Manaslu with superb panoramic view of the mountains. An early morning breakfast and we head towards Barpak driving along the Trishuli River. The first half of the drive will take place on the paved road and the remaining drive on the off road. The reason we chose Barpak to Arughat as a starting point is due to the construction of the roads in the classic route, good view of the mountains and also to avoid the crowd. An easy walk today, the trail is uphill in the beginning from Barpak. The trail passes through the beautiful rhododendron forest. If you happen to be there in spring season, you will see the hills covered with different colored rhododendron flowers. We climb gently till Bhosu Khang (2800m), today's highest point where we stop for awhile and enjoy the view of the Ganesh Himal range and Buddha Himal (6672m). Then we slowly descend towards Laprak village, beautiful Gurung village. Before we reach Laprak village, we pass through Gupsi Danda where the new houses are being built for the Lapraki people after the earthquake, 2015. Today, the descent on the stone stairs continues till Machha Khola river and gradually starts uphill until Sing La village. On the way, we will have the view of the snow capped mountains almost the whole day and the villages like Gumda, Laprak, Lapu are seen at a distant. From Sing La, the trail descends until Khorla Besi passing through Khorla village. As we cross through several steep section open to Budi Gandaki River while passing through herds of mules. 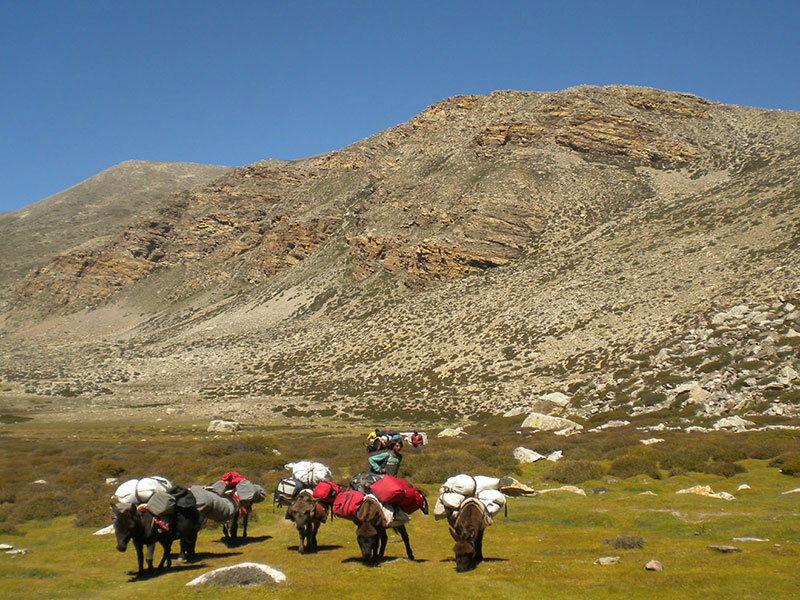 It is important to remain on the wall side to avoid being pushed away by the mules carrying the loads. We arrive at Tatopani, a small hotspring from where we cross the Budi Gandaki River through a suspension bridge. As we arrive at Jagat, we will notice the large cliff on both sides. A gate painted with “Welcome to Manaslu Conservation Area” welcomes stand visibly as we walk a bit further to arrive in our lodge. After our guide takes care of the permits at the checkpoint, we continue our trek through the rocky ridge and several bridges. We see a beautiful village Philim right next to the Budi Gandaki. Crossing the suspension bridge, we take a straight uphill all the way to Philim where we stop over for lunch. The village has a school built by Japanese that you can see while the lunch is being prepared. After lunch we continue through the trails that passes through the village of Ekle Bhatti. After crossing the narrow ridge and narrow trail we arrive at Deng that has few hotels. We spend an overnight here. The trail today passes through the forest and Mani after heading west from Budi Gandaki. Crossing Budi Gandaki several times we encounter several monasteries along the way. As we enter the epic section of Manaslu. Crossing few other settlements we arrive at Namrung that is located next to the Budi Gandaki River. You can take a walk around the village or visit the monastery. The early morning greets you with the sunrise over Shringi Himal, Ganesh Himal and Himal Chuli in the south. After breakfast we will have an easy walk until we cross Lihi village. Just after Lihi village before crossing Hinang River, we head towards the direction of Himal Chuli Base Camp (4020m) at the left for a visit to a beautiful buddhist monastery Hinang Gumba (3120m) and return back the same route to continue towards Lho Gaon. Acclimatization Day: We will start our trek early morning. Easy walk through the pine and rhododendron forest along the river then climb steadily to reach Syala village. From here, we continue towards the suspension bridge. After crossing it, we head towards Punggen Monastery leaving the trail that heads towards Samagaon. 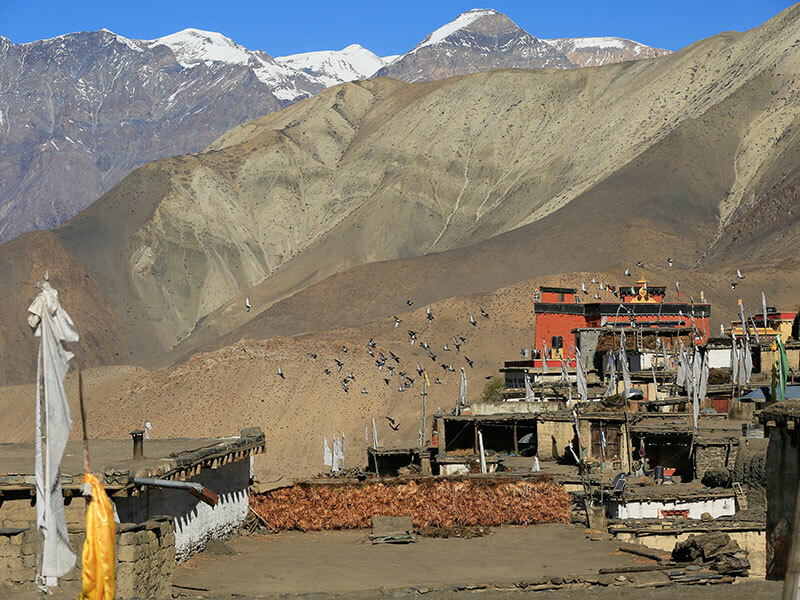 The monastery is situated at the lap of the Manaslu mountain. You are rewarded with the 360° view of the mountains like Manaslu, Hiuchuli, Nadi Chuli (Peak 29) and Rani Peak. After taking some pictures and enjoying the view, we descend down the same trail and continue towards Samagaon. Today is relatively a short walk passing through Birendra Lake and heading northwest of valley as we encounter the chortens and mani walls along the way. We arrive at Samdo in about 4 hours after which you have the rest of the day to yourself. A short and easy walk to Larkyay Phedi from Samdo takes about 4 hours. We cross a wooden bridge as we start ascending from here. Along the way, we can witness the Larkyay Glacier. We continue climbing as we arrive at a guest house in Larkyay Phedi which is also known locally as Dharmasala, there are some isolated tea houses. Today can be regarded as one of the most challenging days of the whole trek. After climb for a short while we get spectacular views of Larkya Peak and Cho Danda. As we ascend towards the pass the trails becomes steeper. Once we arrive at the Larkya Pass (5140M), we are greeted with amazing views of Kangguru, Himlung, Cheo Himal, Gyaji Kang, Namjung Himal, Ratna Chuli and Annapurna II. We descend steep towards Bimthang from here with the view of Manaslu. You need to be careful that some sections while descending are too steep and icy, you are advised to put on your crampons. As the hard part of the trek is over, we head towards Tilje where the trail passes through the dense rhododendron forest and fields slowly coming into sight. Arriving in the Manang district, we are in the restricted part of the Manang after Nar Phu. We continue our trek further down to Gowa where we will have lunch and continue descending towards Tilje. The last day of trip, we start up early following the trail to Dharapani about 1hour. Here, we take the 4x4 jeep to Besisahar. At Besisahar we will take another vehicle to get back to Kathmandu. We will check into our comfortable rooms and enjoy the hot showers and freshen up.